Folks have been asking for something fall-themed for quite a while, so over the last couple of months we've been trying to satisfy that. The result is Autumn Tree, a quite pretty (I think!) attempt at a Macro-style photograph of a tree branches with colorful leaves. The entire thing is real-time 3D as usual, and as you can see from the images here we're doing a soft-focus style blur on the background layer to get a proper camera feel. 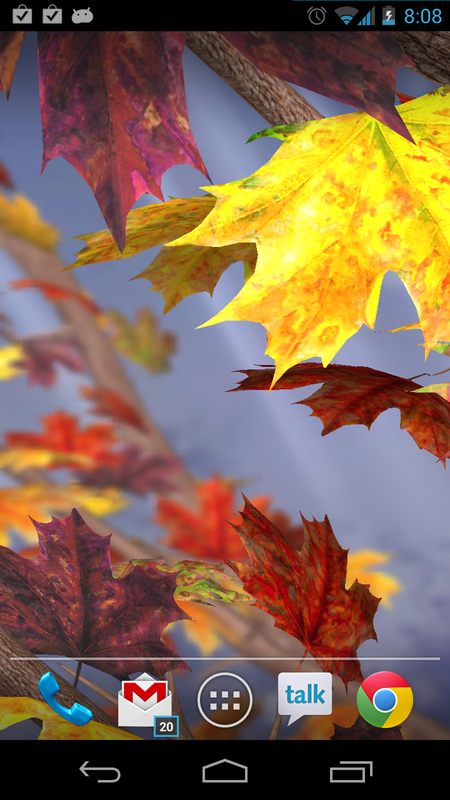 All the leaves are individual and you can swap their colors out, and change the species of tree. Currently we have Poplar, Maple, and Birch... we'll be adding Cherry and Oak before too long. We're quite happy with how this one came out overall, there's still a few things to add but it performs well and looks very nice. Hopefully you folks agree! Really like this one, but it causes my phone to crash. It's colorful, but just ok. 3D effect is good. But seems to be missing your normal Wow factor, that makes me want to purchase it as soon as I get a look at it. I have at least 8 of your paid LWPs, but don't think I Will be upgrading this one to paid version. It does run smooth on 2.34. No issues there. Just seems to be lacking something that is in most of your LWPs. Sorry dev. Nice try though.